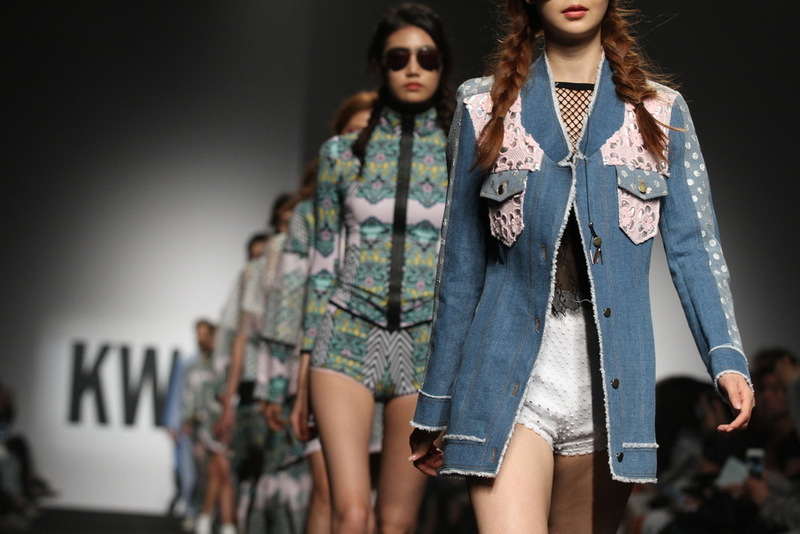 Seoul Fashion Week Spring/Summer 2016 is underway at Dongdaemun Design Plaza. MUTZINE has exclusive coverage of the runway shows this season featuring top models, celebrity cameos, and of course, the latest fashions. The second day brought even more excitement than the first. Some of fashion’s strongest contenders came out to play during Rocket x Lunch’s show–– and we’re not just talking about top model Irene Kim. Stripes, denim, and plaid, all arguably strong forces in the landscape of fashion, each made memorable appearances throughout the show. 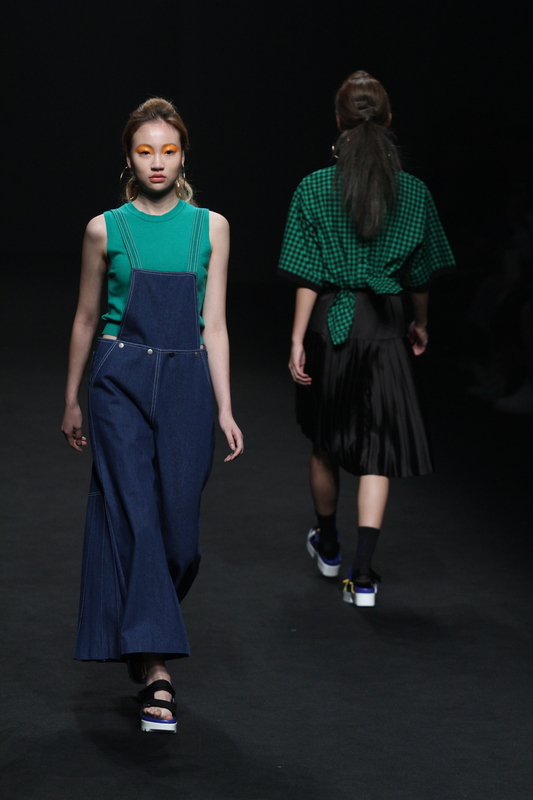 A blend of sporty chic and casual street, Rocket x Lunch’s show remained harmonious even with caps, hoop earrings, slit trousers, and satin pajamas all in the picture. Perhaps it was the multicolored sandals that accompanied each outfit, sometimes with a pair of high socks, that helped keep a sense of uniformity across ensembles. The show’s beauty aspect also came together with the collection's playful aesthetic, with vivid eyeshadow accentuating the models’ eyes and teased hair packing an extra punch into every look. Structure and softness, exposure and modesty––this season, crowd favorite Kwak Hyun Joo introduced a sense of duality into her collection titled “A Door in the Moon". A selection of tailored bottoms and constructed vests paired with unmistakable swagger opened the show, only to be followed by a well-paced transition into flowing hemlines and sweeping wide-legged trousers. Before long, a combination of single-color suits was sent down the runway in irregular alternation with patterned garb in fluid silhouettes. The constant shift between opposite elements kept the audience, celebrity guests like Heechul of Super Junior and VIXX members Leo and Ravi included, on the edges of their seats. Ever playful with her designs, Kwak Hyun Joo mixed in generous amounts of quirk into her Spring/Summer line: think striking print-on-print and tassel fringes lining outerwear, pants, and women's shoes. Sunglasses were also part of the equation, with several pairs boasting of unicorn horns and others with cat ear tips that threatened to bid the conventional cat-eye frames goodbye. At odds with the high spirits that the Spring/Summer seasons usually bring, Caruso presented a collection that was decidedly somber. From the almost funereal music to the hollow-cheeked, barefaced styling of models, the show was a sober spectacle that played into the overarching theme of falling rain. A balanced mix of loose and slim-fitting jackets and trousers made up the bulk of the show, with the occasional pop of teal, yellow, or purple thrown in for good measure. In patchy intervals, more casual looks consisting of loose button-downs or sleeved shirts graced the catwalk. The sound of heavy rain alerted the audience of the show’s finale, which featured all models walking beneath the shade of unfurled purple umbrellas. To the music of a synthesizer-heavy remix of a 1980s’ hit, Surreal But Nice opened strong with a stark white women’s suit, followed by a steady stream of outfits of black and white. However, it was not until a quarter into the show that the collection’s dynamic tag-team was revealed: stripes and sequins. These elements, both used separately and in combination, set the tone for Surreal But Nice’s line. Horizontal stripes were everywhere, from shirts and mini-dresses to sunglasses, and offered a laid-back appeal to the outfits. Meanwhile, sequins served up an ample amount of flair. A nautical theme was carried out across all the designs, from the constant appearance of fishnet stockings to the anchors and stars that adorned shoes and outerwear alike. Berets, a trend from the previous season, also made a comeback during the show.